recent decision. I read your declaration speech. good of their country. We will be praying for you". drawn, quartered and burnt at the stake! pain and hardship on the Nigerian people. care to do the research and find out? he EVER hear from God? merciless demoniac it gives cause for concern. Archbishop of Canterbury sink so low? non-Fulanis. I say shame on you! 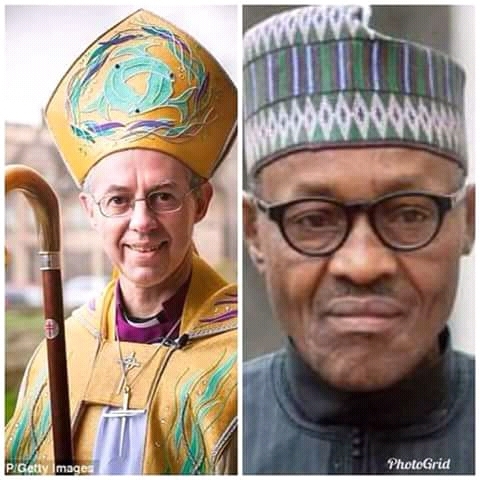 Muslims, IPOB youths and Christians, will fail. father was until two years ago? that being gay is a virtue? grave doctrinal violations of the Holy Scriptures? so since his days at PTF. put the following questions to you. through since your husband came to power? in our country under your husband? witnessed over the last three years? world for Christians to live?" over the last three years? of human blood and butchery under him? human rights violations and mass murder? office and asked him not to come back? eve and Christmas day alone in 2016? the south over the last three years? cattle-herding over the last three years? parts, liver, kidneys and hearts of their victims? pagans and not real Muslims? Christian limbs that are being cut off? any form of violence, as a terrorist organisation? shooting him in the eye? tyrannical government and 2019 ambitions? secretly being drafted into the Nigerian Army? because she refused to renounce her faith? history of Nigeria since he came to power? same court in the past. husband's Fulani herdsmen every day? The truth is that your marriage to Buhari sickens. your back on the whole of Christiandom. murdered over the last three years. injustice and tyranny and to resist evil. murder of innocent men, women and children?"